We’re proud to have commissioned 13 works from 10 Young Composers Award winners over APO’s 13 seasons. These winners have invariably been postgraduate composers, so next season, we’ve decided to do something different and encourage younger entrants. On Saturday 23rd January, 2016, right at the start of Reading’s Year of Culture, we performed Ravel’s magnificent orchestration of Mussorgsky’s ‘Pictures at an Exhibition’. To complement this masterpiece, we commissioned a companion piece, ‘Picture at APO’s Exhibition’. 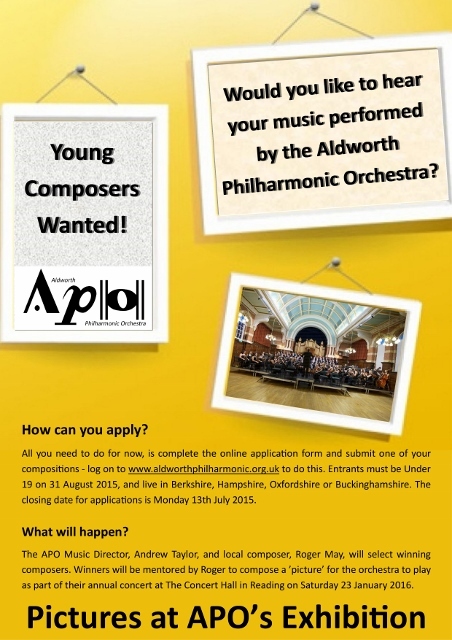 Under 19s on August 31st 2015 and from the Reading area or surrounding counties, were invited to enter our competition to compose a picture for APO’s exhibition. We’re delighted to announce the winners, after a judging process made almost impossibly difficult by the high quality of all the entries. In addition, Maeve McCarthy, 21, who is a APO cellist and an undergraduate composition student at the Royal College of Music under the supervision of Mark Anthony-Turnage, also contributed an orchestral piece to the composition. How did we create ‘Pictures at APO’s Exhibition’? We teamed up with one of Reading’s leading creative arts organisations, jelly. Each composer chose a work by one of jelly’s resident artists, and composed a short piece of music in response to it. They were mentored by professional composer Roger May, but the pieces are all their own work, so that they are eligible for GCSE/A Level or undergraduate submissions. Roger then linked the individual ‘pictures’ together to form the overall piece, ‘Pictures at APO’s Exhibition’, which was then performed alongside the Mussorgsky/Ravel and the Sibelius Violin Concerto at our concert in Reading Town Hall, on Saturday 23rd January, 2016. 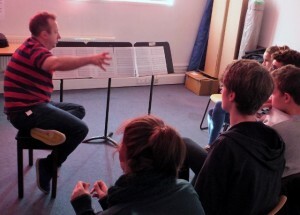 In October, the winners had the fantastic experience of a workshop with world-famous British composer, Mark-Anthony Turnage, who gave up his Sunday afternoon to pass on his guidance in a brilliantly supportive manner. The winners worked with Roger, Andrew and the APO players during the rehearsals leading up to the concert, to tweak and refine their pieces as part of this amazing learning opportunity. Then, each winner received a complimentary ticket to the concert, for the thrilling experience of hearing their music performed live by a full symphony orchestra. 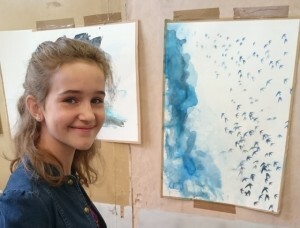 For more details of this project, and to hear the live recordings of the world premiere, head for www.picturesatourexhibition.org.uk. For details of our previous award winners, please see our Past Winners page.